The results are in and Poletical readers have spoken. 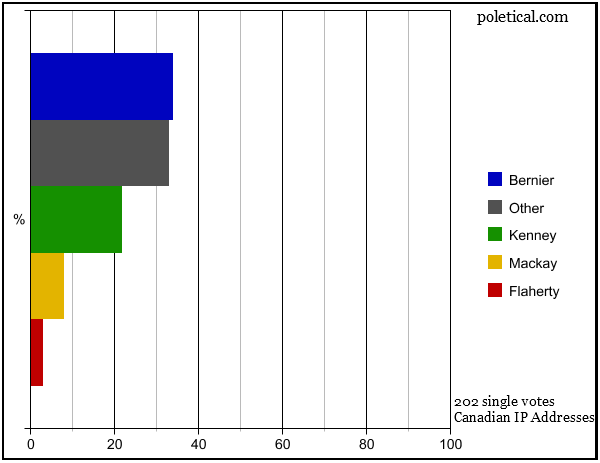 Maxime Bernier is the Prime Minister of choice. At 34%, support for Bernier represents the direction that most people would like Canada to move. Pro-business, pro-freedom, pro-active. The surprising result is that 33% of people chose “other”. What does this “other” represent? Perhaps it represents some underdog choices, like a John Baird or a Tony Clement or a James Moore. These potential candidates are possible choices for the future leadership of the party, but for various reasons they aren’t viewed as frontrunners. Maybe, someone from outside the party is a greater possibility. Rumours are swirling that Jim Prentice is jumping from boardroom to boardroom, amassing backers and supporters with each passing year. Or perhaps someone from another level of government will take a run for the job. Alison Redford is disliked by both Albertan voters and her own party. This probably won’t stop her (or perhaps it will inspire her) jumping to a bigger ship before she’s finished with her current job. In at 22% is Jason Kenney. The social conservatives and western Reformers will be pushing for Jason Kenney. His supporters look to be trying to change the voting system in order to favour Kenney as the next leader. He’s also got a massive pull in immigrant communities coast-to-coast. With some vote splitting he just may take over and we’ll have two Calgary-based Prime Ministers in a row! At a distant 8% is Peter MacKay. This lack of support combined with shifting winds within the Conservative Party have led some to believe that MacKay may be planning an exit. He’s a late bloomer in starting a family and perhaps something with less travel and even bigger cash would look more attractive right now. With a massive Liberal win on the horizon in Nova Scotia’s next general election, perhaps the opportunity will be available for MacKay to return to being a Progressive Conservative provincially as leader of THAT party. And down at a pitiful 3% is good old Jim Flaherty. With his decline in health and his senior citizen level age, he’s probably best to move into ‘gone fishin’ mode rather than try to lead an unwieldy coalition of zany conservatives.